Ever heard of the phrase "Breakfast is the most important meal of the day." Well, I couldn't agree more, that's why we decided on Cora for a late lunch at 3pm on Saturday. Truth be told, I been dying to try it ever since it opened, but I no longer live in Coquitlam, so I am never in the area. Finally the opportunity presented itself when I had to go to Port Moody for the day. 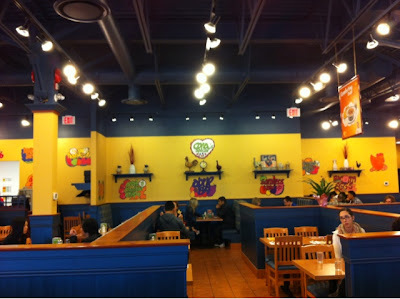 Cora is a chain restaurant that started out in Eastern Canada, and this is their first location in Greater Vancouver. With 'Breakfast and Lunch' right in the restaurant name, it's no surprise that Cora only opens till 4pm for weekend and 3pm on weekdays. Since I've only heard good thing about this chain restaurant (you know how I feel about these), I had some pretty high expectations. 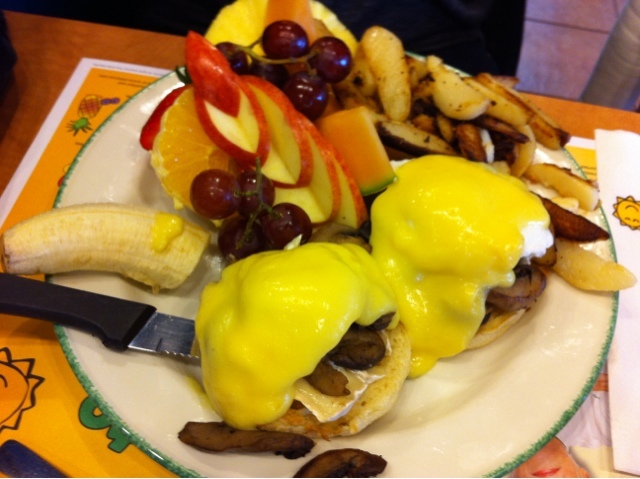 First up is their Mushroom and Brie Egg Benedict. I didn't get a chance to try it, but I heard no complain on it whatsoever. Their speciality is the large side of fruits, since A was allergic to kiwi, they simply switched up with a bunch of grapes. So if you dislike any sort of fruit, make sure to let them know. 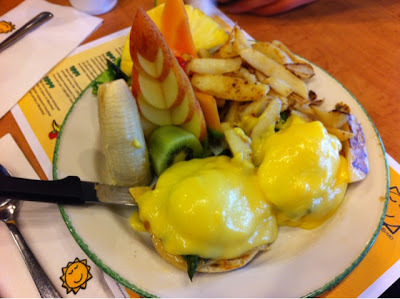 R went for the Asparagus and Swiss Egg Benedict ($12.45?). The hollandaise sauce was creamy and rich. The egg resting on top of the melted cheese with grilled asparagus was perfectly poached with a running centre. Their side of potato was not oily and good, but it was on the softer side. I wish they could have pan fried a bit more for that crunchier texture. Last but not least, I ordered a Ham/Swiss/Egg Crepe Panini with fresh fruits ($11.45?). Just look at that mountain of fresh fruits, not to mention most are pretty sweet too. It was a mixture of strawberries, pear, banana, grapes, mandarins, cantaloupe, honeydew, pineapple and kiwi. As for my crepe panini, it was heavenly. 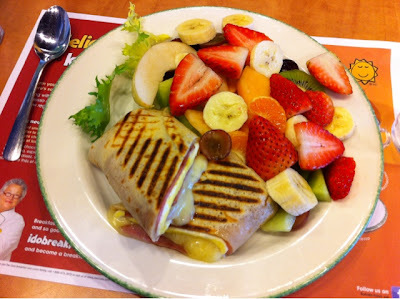 The perfectly grilled panini crepe was thin enough to just hold all the stuffing in without interfering with the taste of the perfectly melted Swiss cheese, fluffy egg and tender ham. To sum it up, I highly recommend this, it was filling and delicious. Service was good, but a little slow at the time. I think this is mainly because we came late, and they were preparing to close. 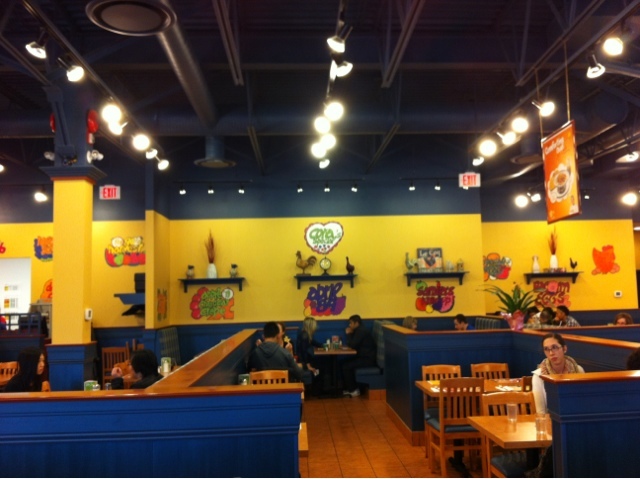 The restaurant was huge, with cheery décor and colours. Their counter was lined with lots of fresh fruits. Overall, this place is perfect for those who likes brunch with a healthy alternative to the typical greasy hash brown and oily bacon. On the other hand, if you like your grease, then maybe this place isn't so much for you. I for one will definitely come back. Wow, the food looks AMAZING. so good that it kind of looks like the food on display in malls.